Read the whole magazine online for free. 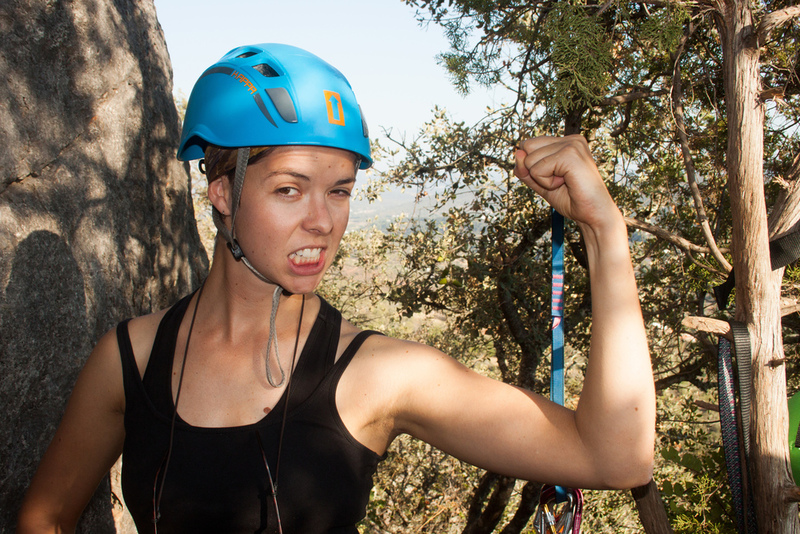 Anna gets to grips with rock-climbing in this month’s adventure. Rocha da Pena national park in the southwest of Portugal is a gorgeous, rugged landscape. The natural habitat of wild boar, mongoose and foxes, there are also Iron Age stonewalls here, evidence of ancient fortifications by long-gone people. On this hot day, we are the only ones around. ‘We’ is me, Kristi and Zeke from Canada, and André Gloria, owner of adventure tourism company Volta do Mar and avid local climber. Emerging from the dense underbrush, we come to the base of our first climb and begin to put on our gear: harnesses, tiny climbing shoes and a helmet. André busies himself setting up the safety belay lines and ties me on at the harness with a figure 8 knot. Apparently I’m ready to go. I look up at the rock. It looms over me, silently. “Yep!” he grins, holding the belay rope in his hands. I approach, and reach out. The rock is hard and gritty and easy to grasp and I quickly get off the ground. I look around with my eyes and then with my fingertips, and when my holds feel secure, I follow with my feet. The ground moves further and further away. There is a good, big ledge just near my left knee. I reach for it, but André stops me. “Baby steps! you don’t want to waste your energy on big lunges”. l look for something smaller, and I wiggle my toes into a small crevasse lower down. I tentatively put some weight on it, and it holds. Actually, my toes feel like they are stuck to the wall, the grip is incredible. “Trust the hold!” André calls out, as if he’s read my mind. “And trust the shoes”. I begin to steadily climb up the face, finding holds, testing them and moving on. For a while, I seems like every time I reach my hand out, I find the exact shape I’m looking for. It could as well be climbing up a ladder, and it feels more than a bit like cheating. A smile creeps onto my face. Soon enough though, I come to my first blank. Moments earlier full of secret, helpful holds, the rock now appears completely flat and featureless. I can’t imagine how I’m going to proceed. I feel around and around without success, and for the first time begin to feel a nervous. I’m far from the ground, hanging by my fingertips, and the longer I’m here, the more tired I’ll get. I turn to look around. It is spectacular. Dense scrub and trees give way to cultivated land, neat rows of olive trees and vineyards, crops and the tiny roofs of houses. This ridge is the highest thing for miles around, and I can’t see a soul. I enjoy the view, and regulate my breathing, while trying to quieten the voice in my head screaming "aaaaaaah get down, what are you doing up here you’re gonna die aaaaah!!" I’m beginning to appreciate how incredibly challenging rock climbing is, both physically and mentally. Most of the battle, André tells me later, is overcoming fear which can paralyze even the strongest climbers. I return to the face. I close my eyes, and slowly feel around me again. I know there is a way, and I find myself trying to connect with the rock, to allow a path to emerge. I move sideways a bit and suddenly I have great holds again. I scoot up for another couple of meters until I’m facing my next challenge: a big overhang that will require me to pull off a tough ‘Van Damme’ split and shimmy up. This is ‘the crux’, the hardest part of the climb. I need to take a side hold, where I put lateral force on a vertical crevasse, but I’ve never done this before, and I don’t quite understand how it works. My hand keeps straying away from the hold that it doesn't like. Time is ticking. My leg is Elvising. I will have to heave my way up and trust my hands to find something to grab so that I don’t fall. I explode up and my hands connect. I did it! André cheers me on from below. Reaching the top soon after is just the icing on the cake, and as André lowers me down, I can feel the fresh blood stampeding through my now off-duty legs. Over the next few hours, we all take turns climbing again and again, finding better techniques, gaining confidence and challenging ourselves both physically and mentally with each ascent. On my last climb, I get to the bottom of another gnarly overhang, and pause. The shadows are getting long, my tired arms and legs are trembling and I can feel that I need to make a break for it, or it will be too late. The moment passes. I’m too tired. I won’t make it to the top of this wall, and that’s ok. The rock’s not going anywhere. Anna did a full day climb with adventure junkie André Gloria of Volta do Mar. Want to read more of my crazy adventures? Click here! I also write about travel all over the world: click here to read more.